The quote comes from an essay by President Hu printed in the party magazine Qiushi, derived from a speech he gave in October to coincide with the release of the Central Committee Decision on culture. My first reaction was to observe, with irony and anger, that the apparently intentional evisceration of Chinese culture, as claimed by Hu, is the very thing that Beijing has been doing to Tibetan culture for the last 60 years. So I found a translation of the article and read it, substituting “Tibetan culture” for “Chinese culture” and “Chinese Communist Party” for “Western forces” where applicable. I had planned to write a blog with excerpted phrases with substitutions that captured the tragic hypocrisy. But by the time I got to the end, my direction had changed. Hu’s essay demonstrates that leaders in Beijing define and interpret culture in a way that is disconnected from the way the rest of the world see it. Culture, in the sense we are talking about, can be understood as “a set of shared attitudes, values, goals and practices that characterize an institution, organization, or group.” It is derived organically, the product of hundreds, thousands or millions of individual people interacting, sharing and creating, giving meaning, shape and a collective identity to their lives. By nature culture is an abstract concept. Hu’s essay also reveals a contradiction in the Party’s approach to culture. Throughout the essay, the word “culture” is always used in the singular, whether in reference to socialist culture or Chinese culture. Yet Beijing recognizes a diversity of cultures in the PRC. An official White Paper says that “the Tibetan people have created and developed their brilliant and distinctive culture.” While a good Marxist may be able to resolve this contradiction by noting that the Paper locates Tibetan culture within the “treasure-house of Chinese culture,” the problem of the singular culture cannot be easily or empirically dismissed. The bubbling unrest among the Tibetan, Uyghur, Mongolian, and now Huipopulations, demonstrate that the Party’s approach to culture is not contributing to the multi-national harmony it seeks. In the coming weeks, the International Campaign for Tibet will release a report provisionally titled “The Case for Cultural Genocide in Tibet.” The lengthy report documents the claim that a cultural genocide is happening in Tibet. It argues that the Chinese state has abjectly failed in its responsibility to protect and preserve the distinct Tibetan culture, a role it selected for itself following the invasion and occupation in the 1950s. The report further argues that saving Tibet’s culture should be a matter of concern for the international community as a matter of policy and as part of the overall trend toward the development of a more comprehensive regime for combating genocide. This brings me back to my original point. Is it possible for government leaders to assert upon themselves the role of protectors of a culture, when they have a fundamental misunderstanding of (if not hostility toward) the very nature of culture? How can a governmental entity, whose official statement on its self-asserted responsibility to manage culture omits the notion of a diversity of cultures within the realm, be accepted as a responsible steward for the various cultures under its control? Is there any possibility that the methods used to study and explain the (alleged) threats to Chinese culture could be employed objectively to develop understandings of the threats to Tibetan culture within the PRC? Can Chinese scholars and citizens even find space to explore these questions free from ideological shackles? Moreover, would there be space for scholars and citizens from other cultures to contribute? Ma’s analysis begs the question of whether Beijing has the capacity or willingness to truly understand who “its own people” and their cultures are, much less genuinely respond to their grievances. 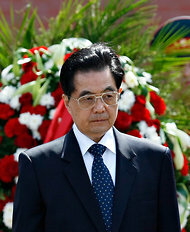 If Hu Jintao the culture warrior truly wants a “harmonious society” as his legacy, it would seem that he has some fundamental contradictions to resolve first.